Visit Mortola during your stay in Liguria, Italy. The famous Hanbury gardens, which are part of the world heritage sites and annually attracts many visitors, are found in Mortola Inferiore.,. The surroundings are also unique. There is a narrow path running past the gardens down to the sea, , and it was earlier also used by fishermen. A trip to the village church is also worth while. It is decorated with wonderful mosaics. From Piazza San Mauro one can enjoy a breath-taking view of the sea and the coast. Worth seeing is also the St.Mary’s Church (Marienkirche) in MortolaSuperiore, where one can see a statue of the Virgin Mary. Mortola is a village in the Ventimiglia municipality. The village is divided into Mortola Inferiore and Mortola Superiore. Mortola was already inhabited in the early Middle Ages and was integrated into the Imperia province. In the 12th century Mortola was integrated into the Ventimiglia municipality. 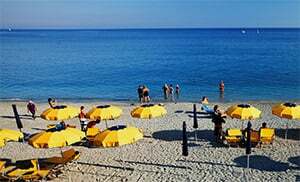 Mortola belongs to the Ventimiglia municipality and is a locality in the Imperia province which lies in the Liguria region. In the vicinity of Mortola are several other villages like: Ponte San Ludovico (1.5 km), Grimaldi (2.6 km) and Latte (1.4 km). From Genoa take the Ventimiglia highway exit, after that take the SS20 then the SS1 up to Mortola.